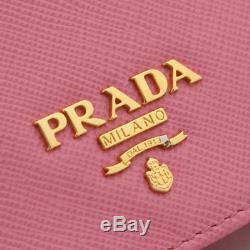 PRADA 1 M 1122 Bifold Safiano business card holder Card Case leather Women. H:6.5cm x W:10.5cmx D:2cm. H:2.6 x W:4.1x D:0.8inch. Closing ceremony:Snap button Card pocket x 2. 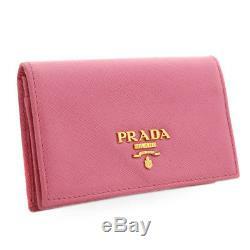 PRADA cute BifoldCard Case arrived. 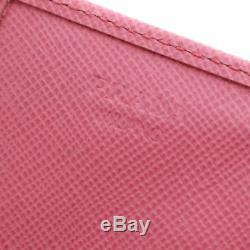 Popular, Safiano leather is used is a luxury item used drifting. 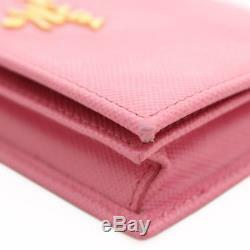 The feminine atmosphere pink color is very pretty, the front logo is a fashionable dish that became a one point. 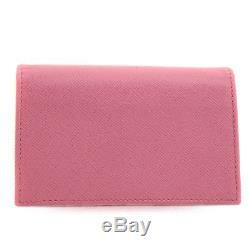 Because there is gore, storage capacity is high, so you can store a lot of cards and business cards. 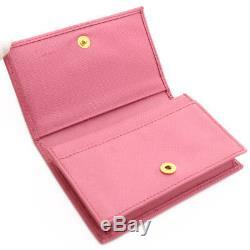 It fits in a compact and small bag and it is convenient to carry. Rank AB It is relatively beautiful goods without conspicuous Stain. There is slightly Wrinkles on the whole, Hardware has a little plating peeling. Inside is a minor stain · There is little darkness, Indentation of the button can be seen. Although overall feeling of use is felt, you can still use it. Corners: minor stain Metal: Peeling. New Never Used / Allmost as good as new. New / Unused There is nearly as good as new in the condition about 1 to 2 times used. Excellent There is the slight feeling of use, like normally used small scratches/dirt, but the state is good. Very Good There is a feeling of use, like small/medium scratches, dirt, but relatively good condition items. Good There are scratches, dirt, but can use it normally. Recommended for those who do not mind the details. Decent There is a feeling of use considerably. 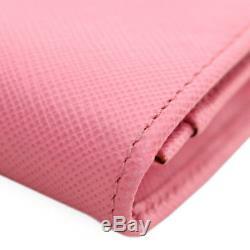 Though scratches and dirt are conspicuous, that can be used satisfactorily. Usable There is a slight difficulty. Used with a lot of use feeling. The state with conspicuous damage. Needs repair There are junk items. There have breakdowns, tears, etc. Items that are difficult to use at present. These charges are the buyers responsibility. 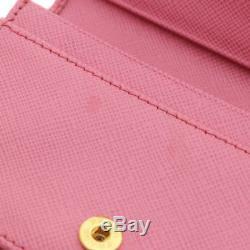 We do not mark merchandise values below value or mark items as gifts? US and International government regulations prohibit such behavior. All Items are sent from Japan. If you have any problem or question, Please contact to us ASAP. 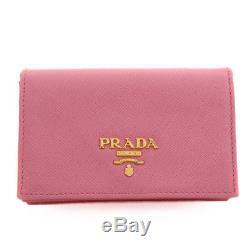 The item "PRADA 1 M 1122 Bifold Safiano business card holder Card Case leather Women" is in sale since Saturday, November 24, 2018. 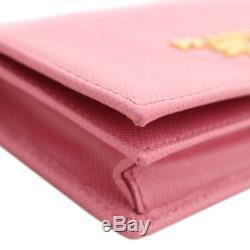 This item is in the category "Clothing, Shoes & Accessories\Women's Accessories\ID & Document Holders". The seller is "brand-eco" and is located in Osaka.